I am a Chinese, inside out. My mother and father, and both their father’s mother and so forth are all Chinese. In other words, I am a typical Chinese. My mother’s father, came directly from China, during the time many immigrants flocked here to seek a better life. Coincidently, my mother’s mother came to Malaysia in the same way, save maybe in a much later date. As for my father’s side, it was my great grandfather who also came from China to do business. I am also, a Taiping ‘kia’ (the word is in Hokkien for child), inside out. I said this because both my parents were born and bred in Taiping, including my father’s mother. Same goes for me. There is so much to talk about this hometown of mind, and I will bit by bit introduce it you readers. I had numerous pictures from Taiping, food especially, go figures, to share with you guys. I’ll be going back to Taiping this weekend, for my Grandmother’s birthday (I am also thinking of baking a cake for her, look out for it as it would be butterlees and milkless, my Grandma cannot stand dairy) and I promise to get more food pictures from town. As for now, my subject is about my Chinese origins. I had intend to further explore food from my origins, due to inspiration from Barbara from Tigers & Strawberries, where she wrote a lot of thought provoking articles of how to appreciate Chinese cuisines and its various forms and arts. So I had decided to make something created in Chinese cuisine, and came up with baking egg tarts. It was an absolute hit in my house. I referred to a recipe at KC yet again, and had modified the fillings. 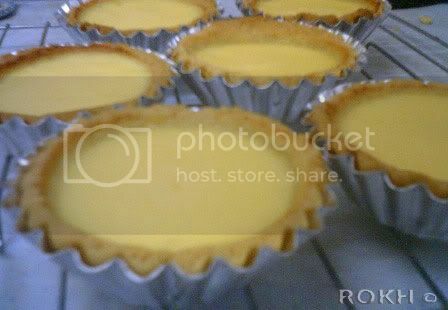 According to Wiki, egg tart is a type of pastry from Chinese cuisine. It was created during the time British colonized Hong Kong. SeaDragon from Café of the East had a nice write up bout how the word came about. 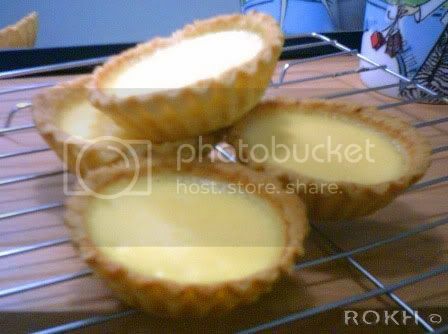 You can also see the picture of how an egg tart looks like in Wiki, although the crust I made was not those flaky ones. I ran over the recipe to do the flaky crust and was at first afraid of the procedure of combining water and short dough together, something like how you would do puff pastry. Then dignified, I wanted to try it but then was once again put off, this time for the amount of butter involve! It doubles the amount I would have use for a normal crust, like those you would have in tarts. Therefore, I resort to making the pie crust instead. Last time when I was young, I did not know how to enjoy egg tarts, maybe because my family seldom buys it anyway. Then came Portuguese egg tarts to town, these tarts are from Macao origin, neighbour to Hong Kong, and the crust was superbly puffy and the filling is extremely rich and thick. Alas, I have yet brave enough to make this favourite of mine, I might when one of these weekends I’m geared enough. Anyway, now that Portuguese egg tarts had ignited my interest in egg tarts, I decided to make one at home. Although, it would be completely different from my favourite type, normal crust with simple filling, I found this recipe a keeper as the crust was just at the right crunch and the filling was smooth and tasty, much unlike the watered down ones outside. Do give it a try, even with any pie crust you have. After all, it is just egg custard in pie crust. Ah, the beauty of simplicity. I had discovered a really genius way to make the tart crust! Alright maybe not really genius or maybe everybody does it but it just came to me (the light bulb effect again) to use the rolling pin to flatten it first and then cut it out with a mug. Yes, you heard me right, a mug which you use to drink your hot cocoa from, as it would create a size just slightly smaller than the tart cases. Remember to roll it just thin enough, press mug to the flatten dough, softly lift the cut out piece and place onto the tart case. Push up the sides to meet the ends. I also found that once baked, the crust will shrink slightly, therefore for my second batch, I had pinch the crust slightly higher than the sides and it will shrink to perfect size. Another reminder is to watch it while it baked so not to over done it resulting in cracks (it was told by a forum member). When done, the custard might be slightly jiggly in the middle, and not to worry as it will harden once cool. Sift the flour and then rub in the butter with your fingers till crumb-like. Then knead it to form dough. Take a portion out of the dough, flatten it with a rolling pin. Cut out in round shape, and press it into the tart moulds, using your fingers to push up the sides and evenly into the zig-zag shapes. Bake the tart crust for 10mins. Put water and milk into saucepan and heat it till nearly boiled. Then add in sugar and whisk it till dissolved. Add the lemon juice and remove from stove, set aside to cool. Beat the eats lightly and filter it through a sieve. Combine the eggs with the prepare sugar and milk water, set aside. Pour egg mixture into crust and bake at 180C for about 10 – 15mins. Place on the cooling rack. Devour it while still slightly warm and be surprised how wonderful it is.